Taiwanese director Hou Hsiao-Hsien has made the ninth-century Chinese province of Weibo into a mystical and painterly world of mist-wreathed lakes, emerald green forests, silvery-pale birch tree glades and glowing sunsets. He occasionally frames these landscapes within the openings of gorgeous interiors which boast costumes in jewel colours, rich brocades, filmy translucent veils and draperies until they eye of the viewer is overwhelmed with sumptuousness. The dreamy exteriors filmed in Inner Mongolia and China’s Hubei province are a feast for the eyes, thanks to Ping Bin Lee’s cinematography which finds a balance of colours and textures in every shot. The Taiwan-set interiors are no less vivid - Hwarng Wern-ying’s obsessively detailed production design, all flickering candlelight and resplendent fabrics, is truly stunning. However, an eye for colour, artistic framing and balance of composition is no stranger to the Chinese historical drama, suffice to say, these movies are celebrated for these qualities with good reason. What makes Hou Hsiao-Hsien’s movie different is his attempt to keep to the classic conventions of ‘Wuxia’—the literary Chinese genre of wandering warriors and their codes of honour—but here obscure them with an unusual and mysterious storyline. His movie is an adaptation of a tale written by the Tang Dynasty scribe Pei Xing, titled ‘Nie Yinniang’ after its female protagonist who is “The Assassin”. Out of this Hou creates a dense historical narrative which, unless one is familiar with, or fascinated by, the internal political machinations of ninth-century China, may be somewhat difficult for the layman to follow. I may have a very slight advantage, having lived in Hong Kong for several years, but as far as I can apprehend, the story concerns the fate of Nie Yinniang (Shu Qi) who was given over to a nun, Jiaxin (Sheu Fang-yi ) in childhood. Not a nun as Westeners might understand the term, less a religious vocation and more a ’career’ nun – a woman who has dedicated herself to a solitary path, eschewing marriage and motherhood, choosing instead to develop other skills and to pass them on. Interestingly, this particular nun is dedicated to the stealthy art of killing. Yinniang is therefore raised to be an efficient and remorseless assassin of corrupt lords and court officials. 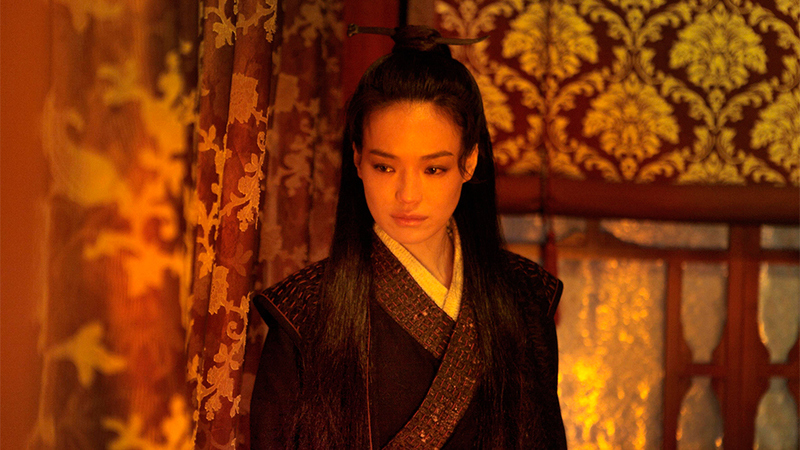 Perhaps the term ‘Assassin’ here is used slightly ironically, because throughout the film Yinniang exercises her profession at her own discretion, ignoring the orders of her commander. After Yinniang’s ruthlessness fails her when she confronts a target and, moved by the presence of his young son, chooses to spare his life, her teacher Jiaxin sends her on a mission that is supposed to punish her and also rid her of her pity. Her assignment is to kill Tian Ji’an (Chang Chen), the cousin to whom she was betrothed as a child, and who is now the governor of Weibo, a positon procured partly by a politically expedient marriage, causing Yinniang to have been overlooked and sent away. She makes her presence known to him through a series of furtive ambushes highlighting her swift and unerring skill, although as with her last assignment, she never quite allows herself to go in for the kill. So it appears to be, but it is implied that Yinniang’s insight and compassion, far from making her weak, is ultimately a kind of power: In a world where individual lives can be limited by stifling social conventions and circumstances, or are pawns in the fluctuations of history, Yinniang decides to control her own actions, despite how they conflict with others and what personal danger might ensue. We see her attacked both by mysterious assassins and by her teacher Jiaxin. Yinniang merely fights them off, leaving herself and her assailants relatively unscathed. Since Hou Hsiao-hsien began working on this ninth-century Wuxia epic, his admirers have been curious as to how the Taiwanese auteur known for historical panoramas such as ‘Flowers of Shanghai’ and urban portraits like ‘Cafe Lumiere’ would handle one of China’s most popular genres. As it transpires, ’The Assassin’ is as visually exhilarating as we might expect, but few will be able to say that they understand it. The movie resembles the distant past of Chinese artworks, in which everything from war, to landscape; to routine interchanges, are cultural forms of symbolism and art. Its minimal dialogue is spoken in the Classical Chinese language and takes place in an arcane world of gestures and values so obscured in the realms of history as to be nearly impenetrable. Even the fights—no two of which are directed the same way—are filmed as though they are artworks with an obscure meaning. Characters appear and disappear, with apparently no other function in the story than to be opaque symbols or objects for the viewer’s deliberation - which may be the point.